For salad dressing: Place all ingredients in blender and blend until smooth. Refrigerate until ready to use. Slice each romaine lettuce head in half, lengthwise, and rub with olive oil. Grill 4-5 minutes on each side. 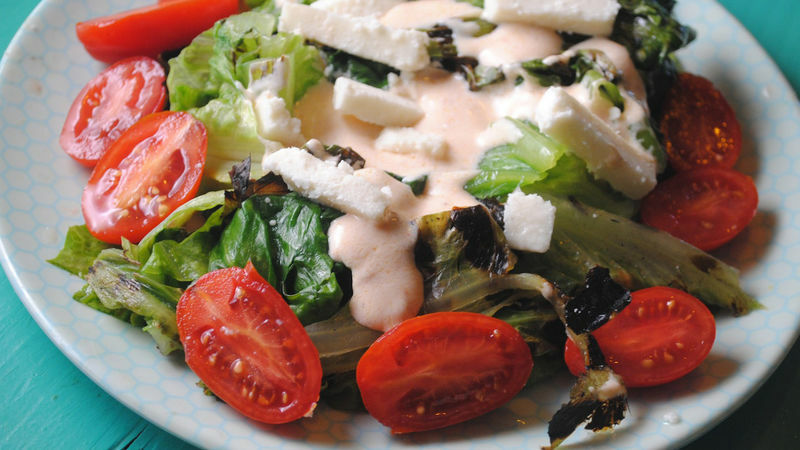 Serve warm with sliced cherry tomatoes, queso fresco and spicy salad dressing. Swap Out – Experiment with various types of lettuce or grill fruit alongside your lettuce for a sweeter salad. Think you can only grill beef or chicken? Wait until you try grilling your next salad! With a hint of smoke from the grill and a splash of spicy dressing, this salad will soon be your next go-to summer meal.